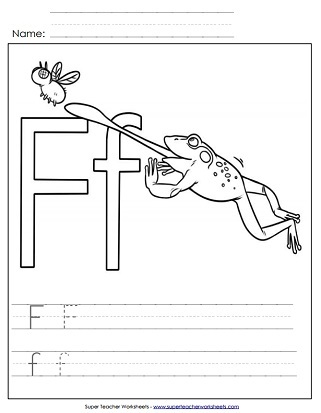 Practice writing the letters F and f on the primary-ruled lines and then color in the picture of a frog catching the fly. Students can color in the pictures of a fan, fish, and flower on this fun hat. Then practice writing upper and lower-case F on the primary-ruled lines. Practice handwriting lower-case f on this printable worksheet by tracing the dotted lines. This worksheet is perfect for practicing writing lower-case f by tracing the gray lines. 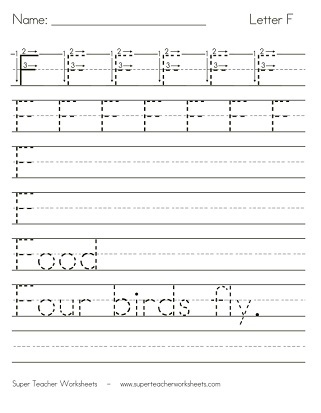 Trace the dotted lines within the primary-ruled lines to practice writing capital letter F.
Printable handwriting worksheet to practice writing capital letter F.
Find the letters F and f, then write F and f five times, then write words that start with f.
Use an ink dabber to stamp the circles in the shape of letter F.